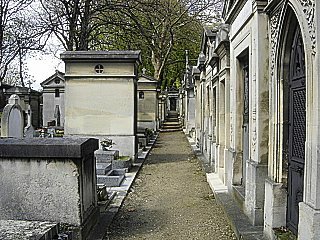 Pere Lachaise Cemetery was called "The East Cemetery" when it opened on May 21, 1804. However, it attracted little use because people felt that it was just too far away and in an "unfavorable" neighborhood. In its first three years it contained only 60 graves. Pere Lachaise, Father François de Lachaise dAix, a Jesuit, was the Confessor for Louis XIV. It was on this hill where he built a Jesuit Rest House in 1682, which later became his residence. With his name being attached to the property for some 120 years, the name Cimetiere du Pere Lachaise, Cemetery of Pere Lachaise, was a popular one. 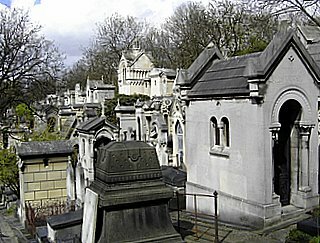 To encourage the purchasing of grave sites here, officials began to re-inter celebrities from other graveyards, beginning with playwright Moliere and poet La Fontaine and the ancient remains of Abelard and Heloise, whose tragic love affair from the 12th century is legendary among Parisians. The idea worked. By 1830, the number of grave sites purchased at Pere Lachaise Cemetery jumped to 33,000. 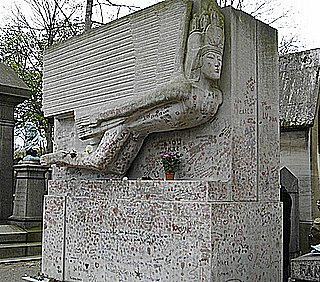 Honore de Balzac, who is also buried here, wrote a series of short stories for a weekly publication in which characters who died in these stories were buried at Cimetiere du Pere Lachaise. This brought some public attention and notoriety to the cemetery. People began to visit this Paris Cemetery in search of those fictitious graves. It has since become the most prestigious and the largest cemetery in Paris, covering more than 100 acres and containing more than 70,000 graves where over one million are buried. Most of the graves are family graves. When a family member passes away, the family grave is opened and the newly deceased is interred, so there are several bodies per grave. The family owns the grave site and it is their responsibility to maintain it. Some have done a better job of it than others. 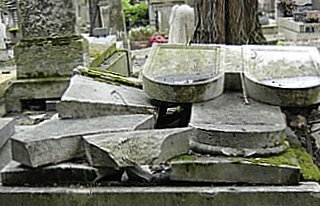 Due to this, the Pere Lachaise cemetery now leases grave sites for 30 years. If the family does not re-new its lease, the occupants are removed and the grave is re-leased, pardon the pun. During the 12th century this hill was mostly vineyards and was known as "The Bishop's Field". Today, the hill itself is known as Mont Louis. At age fourteen, Louis XIV went there to view the battles of the Fronde uprising occurring in the suburbs of Saint Antoine. Because of this royal visit the hill got its name. Another story is that Louis XIV visited the Jesuit Rest Home and in his honor they named the hill after him in thanks for that visit. In 1823, a Chapel was built on the site of the Jesuit Rest home by architect Hippolyte Godde. In 1825, he constructed the gates of the main entrance to the cemetery. During the Communard Uprising of 1871, Pere Lachaise cemetery was a battle-ground for one of the last battles of that Uprising. 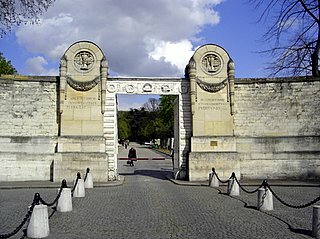 On May 28, 1871, 147 combatants were executed near a wall of the cemetery now called "Mur des Fédérés", "Wall of the Federates". Another 690 of their fallen comrades were buried with them in a common grave along this wall. Pere Lachaise cemetery has over 5,000 trees including, oaks, maples, ash, planes, accacias and hazelnut. Some of these trees are over 100 years old. The grounds are divided and marked into 97 divisions helping visitors locate a specific grave. Since 1986, along the east wall of the cemetery is a "Garden of Remembrances". It is a place where the ashes are spread of those cremated and which are not kept in the crematorium or by the family. Several structures and tombs have been classified Historical Monuments here, Hippolyte's chapel and entrance gate, the sculpture "Monument to the Dead" by Bartholome and the graves of Moliere, La Fontaine and Abelard and Heloise. 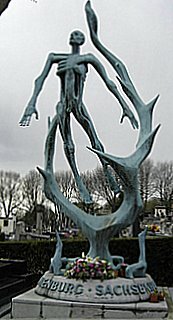 Pere Lachaise cemetery also has memorials for World War I, the Holocaust and other victims of wars, civic workers and catastrophes, such as airline disasters. 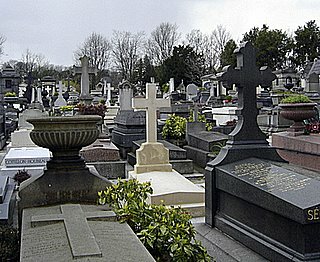 There are more than 100 notables buried here such as Felix Faure, President of France from 1895-1899, international statesmen, authors including Marcel Proust, Oscar Wilde and Apollinaire, painters such as Louis David, Eugene Delacroix and Theodore Gericault, musicians such as Fredrick Chopin, Georges Bizet, Edith Piaf and Jim Morrison. All municipal Paris cemeteries are open everyday and there are no admission fees. 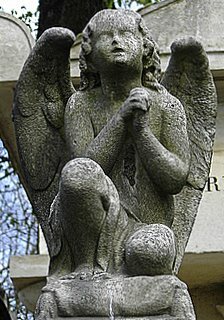 The hours for Pere Lachaise Cemetery are from 8:00 a.m.-6:00 p.m. during the summer months and until 5:30 p.m. during the winter. It opens at 8:30 a.m. on Saturday and at 9:00 a.m on Sunday and holidays. Free maps and information are available at the Conservatory Office located just north, left, of the main entrance on Boulevard de Menilmontant. Office hours are from 8:30 a.m.-12:30 p.m. and from 2:00 p.m.-5:00 p.m. It is closed on week-ends. The main entrance of Pere Lachaise cemetery is used primarily by cars. Gambetta station on line #3, with its entrance at the top of the hill allowing for a down-hill visit of the cemetery and not up-hill as from the other stations. At each entrance is a map of the cemetery marking the locations of the famous. Toilets are found just to the left of the main entrance, in the Conservatory office building, near the Philippe Auguste metro station entrance and and at the Gambetta entrance. Bring an umbrella. Being that it's a cemetery, in Paris, it may be raining. Ravens fly amongst the trees here and black cats have been seen sneaking around the graves of Pere Lachaise cemetery.